The Minneapolis-St. Paul Mini Maker Faire is an experiential event built for creative minds and busy hands. Coming into its fourth year held at the Minnesota State Fairgrounds, this family-friendly event serves as a gathering of fascinating, curious people who enjoy learning and love sharing what they can do. From engineers to artists to scientists to crafters, Maker Faire is a venue for these "makers" to share their hobbies, experiments, and projects. The event’s interesting combination of hands-on making with demonstrations and workshops, live music and performances, and opportunities for conversation with makers of all kinds makes it a prime environment for play and creativity to flourish. An event that aims to be interactive and tactile, the Maker Faire team believes that no matter your age, you’ll connect with your curiosity amongst the giant sculptures, unusual vehicles, robots, textiles, lasers, and beyond. The Maker Faire team also believes that the event’s success really begins with event host, Leonardo’s Basement. This nonprofit educational organization provides creative learning environments for kids of all ages to design and build from their imagination. Since 1998, it has offered classes at its own workshop, schools, and community events, providing tools and materials to design and build projects of all kinds—from engineering to art to technology. With the support of this local organization, Maker Faire MSP is able to thrive as an event celebrating the bold innovation of makers and nurturing the curiosity and experimentation that inspires learning. 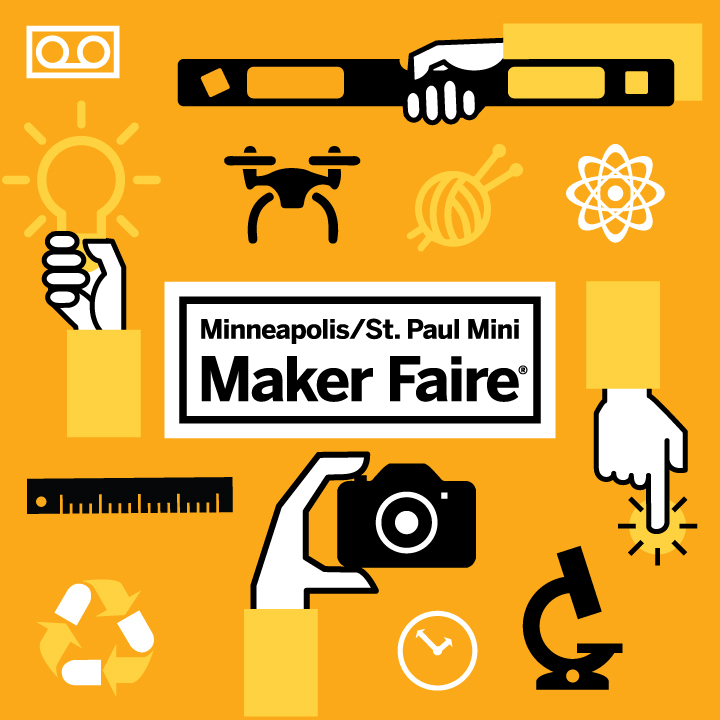 Another vital component of Maker Faire MSP is its Education Day, which takes place on Friday, June 1, 2018, and offers a sneak-peek of the Minneapolis-St. Paul Mini Maker Faire to 7th grade students. The half-day interactive learning opportunity is free for students from schools with 50% or more students eligible for reduced fee or free lunch. New in 2018, there are also spots available to students in schools who do not meet that threshold for $5 per student. The Maker Faire MSP team ensures the academic value of Education Day–and beyond that, they also love to engage students and teachers as they try their hands at painting, flying a drone, screenprinting, soldering, and building their own projects. For the past four years, the Maker Faire MSP team has set out to create an event that encompasses a wide variety of making and serves as a place to showcase and celebrate the magic of making. Participating artists and makers supply the creative fuel for the event, sharing their unique talents and fostering a sense of community through making. One of these makers is Jana Komaritsa, a Russian-born multidisciplinary artist currently based in Saint Paul. At Maker Faire, Jana will be sharing some of her most recent work featuring beloved furry pals - meaningful pet portraits she creates through Purr Party. It’s Jana’s first time participating in the event, and she looks forward to connecting with her community! Another local participating maker is Hannah Campbell, the maker behind Tactual Goods. Hannah is an artist/designer with experience working with a variety of materials and processes, including bronze casting, woodworking, laser engraving/cutting, 3D printing (plastics) and CNC routing. Her most recent pursuits have been at the intersection of art, design and technology, making her a perfect fit for Maker Faire MSP! This will be Hannah’s second year participating in the faire and she plans on sharing some of classics and well as new goods this time around. Scott Backer, the maker behind Lil’A Design, will be attending Maker Faire MSP for the first time this year, sharing his upcycled metal creations. Scott creates sculptural pieces with one thing in mind: keep junk out of the landfill. From there, Scott believes they take on a life of their own and bring a touch of whimsy, a delightful textural element, and a piece of uniqueness to many homes, gardens and other outdoor spaces. It all comes back to the ubiquitous creativity of Maker Faire MSP—around every corner you’ll find an omnipresent curiosity. Palpable and inspiring, it’s a day of strolling and admiring, or perhaps a day of hammer swinging and screenprinting, or maybe a day of learning tips and tricks from a local woodworker—or better yet, all of these! No matter your age, interests, propensity for making, shoe size, or anything else, Maker Faire MSP welcomes all to join in on the fun! There’s still time to get discounted tickets! Purchase yours HERE. Volunteers are needed before, during and after the Faire to ensure that everyone has a fun and fascinating time. In exchange for your hard work, you will receive a volunteer t-shirt and free admission to the Faire. More details HERE.